I bought a used Heathkit SB-200 linear amplifier way back around the year 2000. 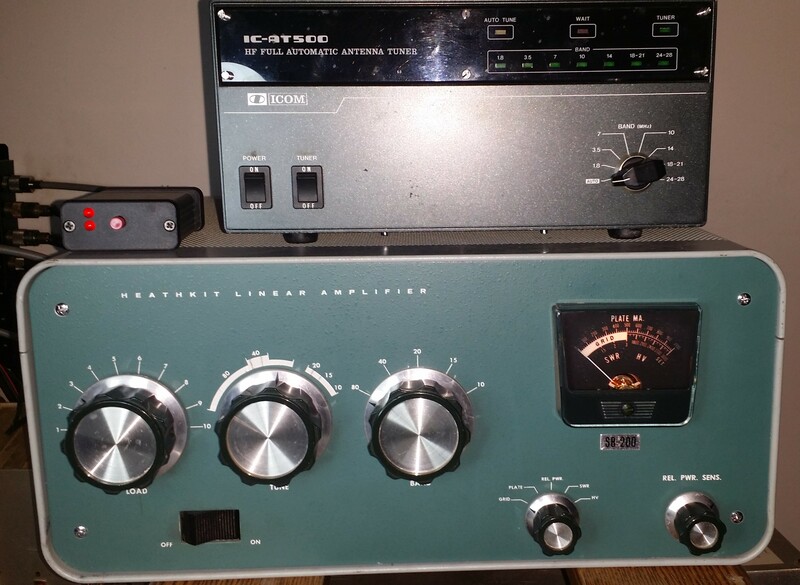 I didn’t need it at that time because I had a Heathkit SB-220 amplifier that was a functioning piece of equipment. The SB-200 has been sitting in my basement getting older and gathering dust ever since. Just this last month I made the effort to restore the SB-200 to its old glory. Heathkit sold thousands of SB-200 and SB-220 amplifiers. Since Heathkit went out of business, an entire cottage industry appeared supporting these popular amplifiers. Power supplies, QSK modification designs, added band designs, and parasitic oscillation suppression schemes are available. The SB-200 uses a pair of 572B triodes in grounded grid configuration to deliver 500 to 600 Watts CW output. For SSB peak envelope power (PEP) output, it will run up to 1,000 Watts out. One downside is that the SB-200 only covers the old, standard five frequency bands of 80 to 10 meters, without 30, 17, and 12 meter operation. There is one more negative point. To key the SB-200 amplifier, your transceiver has to be able to switch up to 150 VDC. Most modern transceivers can switch amplifier keying voltages of only about 12 VDC. Without an interposing relay, the high DC voltages will absolutely FRY your pet radio. HamGadgets has a Universal Keying Adapter that will solve this problem. You can see this adapter in the picture at the end of this article. It is the little box on top of the amp, next to the AT-500 antenna tuner. High quality kits from Harbach Electronics were used in refurbishing the SB-200. For about $115.00 I got the combination power-supply board and kit, plus the soft-start board and kit that limits the in-rush current into the power transformer. The last sentence in the power supply instructions tells you that you will never need another power supply for your SB-200. I believe them. Harbach does a great job. Last Wednesday morning I put the amplifier on the air in a seventy-five meter QSO with some folks in Illinois, New York, and Pennsylvania. The frequency was 3720 KHz, and I was there at 5:00 AM because I had been told that one of our NFARL re-located club members, David Sturm, would be on frequency. He now lives in Ecuador and is operating with the call HC5/WB4OZM. He told me earlier, confidentially, that his new Ecuador callsign will be HC5DX. The guys on frequency told me that I was way too early for David. The amplifier was tuned and loaded to 6oo Watts out at that frequency, and I was probably hitting close to 1,000 Watts PEP on SSB. I was proud that my hard work was paying off. Fortunately, my Alpha-Delta parallel dipole antenna has a VSWR of 1.3:1 at that frequency. How lucky can you get. ham bands from 160 meters through 10 meters, including the WARC bands. I have had this tuner for over twenty years after buying it used at HRO. I wondered if I could use this auto-tuner with my SB-200 to cover more bandwidth on some of the bands I operate. This was one of those “DUH!” moments. You see, the auto-tuner can handle up to about a 3:1 mismatch. The pi-network output of the amplifier can probably handle a similar mismatch. I tested the amp on forty meters at the bottom of the band (7003 KHz) where the mismatch on my dipole was measured 3.65:1. It handled the mismatch well. I only ran the power up to 400 Watts to be conservative. There is no use for the auto tuner with a pi-network output tube amplifier. If I want to handle larger mismatches, I will need a high-power transmatch. I now have a nice 500 Watt linear amplifier for most of the ham bands. SB-200’s can be bought on the used market for $200 to $800 dollars depending on the condition of the amplifier and its tubes. New tubes will cost over $150 for a matched pair. Pretty much all of the tubes for these older amplifiers are made in China. Working on high power amplifiers is not for everyone. My training on working on high-voltage apparatus came when I worked at an AM/FM/TV broadcast station as a transmitter engineer. You really need to understand the dangers involved, even in a small amplifier where the high voltage is 2,400 VDC. It can kill you. 73, and see you in the contest.